This artist's impression shows the transiting exoplanet Corot-9b, the first "normal" exoplanet that can be studied in great detail. This planet has the size of Jupiter and an orbit similar to that of Mercury. It orbits a star similar to the sun located 1500 light-years away from Earth towards the constellation of Serpens (the Snake). Like our own giant planets, Jupiter and Saturn, the planet is mostly made of hydrogen and helium. A newly discovered exoplanet is the first such alien world to resemble the planets in our own solar system, researchers announced Wednesday. The planet, dubbed CoRoT-9b, was found to be about the size of Jupiter and situated at an orbit similar to Mercury, which is the innermost planet in our solar system. While that seems close, it is much farther away than other gas giant planets found around alien stars with the exoplanet detection method used in the new study. This distance in turn means that CoRoT-9b has a more temperate climate than other gas giants ? so-called "hot Jupiters" ? that can experience radical temperature swings. The research team also thinks that the planet has an interior composition similar to that of Jupiter and Saturn. "Like our own giant planets, Jupiter and Saturn, the planet is mostly made of hydrogen and helium," said team member Tristan Guillot of the C?te d'Azure Observatory in Nice, France. "And it may contain up to 20 Earth masses of other elements, including water and rock at high temperatures and pressures." The newfound planet was discovered by the French space agency CNES's CoRoT satellite, which detected the telltale light signature of the world transiting ? or passing in front of ? its host star from the perspective of Earth. Because it transits in front of its parent star for about eight hours, astronomers are able to learn a good deal about the planet. 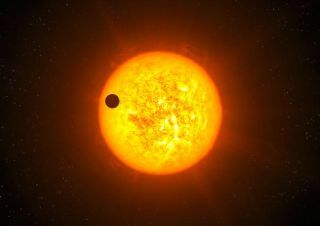 "Our analysis has provided more information on CoRoT-9b than for other exoplanets of the same type," said Didier Queloz of the Observatory of the University of Geneva in Switzerland and one of the astronomers on the team that discovered the planet. One thing that makes CoRoT-9b such an important find is that its distance from its parent star is about 10 times larger than any other planet previously discovered with this transiting method. It also has a low eccentricity orbit, compared to many other exoplanet gas giants discovered so far, which means that its distance from its star doesn't vary wildly like that of other exoplanets. It is that stable distance that allows CoRoT-9b?s more temperate climate, researchers said. The team that reported the discovery of the planet in the March 18 issue of the journal Nature estimates that CoRoT-9b's surface temperature is somewhere between minus 4 and 360 degrees Fahrenheit (minus 20 and 160 degrees Celsius), with small differences between its day and night sides.